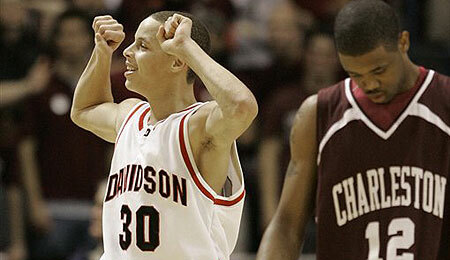 Stephen Curry, left, has reason to be stoked after his MVP performance led the Wildcats to another Southern Conference title. SKINNY: The Wildcats rode one of the top offenses in the nation to a school record 29 wins, shattering the previous mark set in 1968-69 ‘ also the last year Davidson won a tourney game. The club lost just once in conference play on its way to the Southern Conference title, and after getting knocked out as 15 seed last season, Davidson can expect a better draw this year. HISTORY: This is the club’s second straight Southern title and tourney appearance and third title since 2002. Since Coach Bob McKillop took over the coaching reins at Davidson in 1989, he’s guided the team to four tourney appearances, which is a new school record under any one coach. All told, the Wildcats have made it to the big dance eight times, with an overall NCAA tourney record of 5-9. STRENGTHS: Offense, FT shooting, rebounding, ball distribution. Davidson excels is virtually every facet of its offense, ranking second in the nation in field goal attempts, third in field goals and 3-pointers made and third in 3-point attempts. They lead the Southern Conference is almost everything, but also are in the top 10 in the country in overall scoring with over 81 PPG. Even better, the Wildcats have more defensive and total rebounds than any other Division I school and are tied for fifth in overall assists. WEAKNESSES: Honestly, it’s hard to find one, but the club is relatively weak in shot blocking, even with Boris Meno averaging 1.1 swats per game. The biggest thing this team has to overcome is the fact that it has played a very easy schedule, ranking 209th in the country in terms of strength of schedule. KEY PERSONNEL: Freshman guard Stephen Curry turned some heads this year with his conference-leading 21.2 PPG (10th in the nation) and 4.6 RPG. Not highly recruited out of high school, he proved he can bring it with his penchant for big-time plays and an MVP performance in the Southern tourney that saw him score 79 points in three games including 29 in the title game. Curry is an athletic shooting guard who can create his own shot, has the skills of a combo guard and a tremendous knowledge of the game. However, that shouldn’t shock anyone considering he grew up on the game as the son of former NBA player Dell Curry. Junior Jason Richards took over as the Wildcat starting point guard after two years as an understudy and he did a masterful job running the offense, exploding for 13.6 PPG and 7.3 APG, good for second in the nation. A true PG with a pass-first mentality, Richards enjoyed a solid 2.4 assist-to-turnover ration and 1.5 SPG. INTANGIBLES: Can this team finally get over the hump after opening round losses in its past three appearances? Coach McKillop has developed a great system, and with a powerful offense led by Curry ‘ who has something to prove after being ignored by bigger programs coming out of high school ‘ this could be a dangerous team to face, assuming it can compete against the tougher programs. This entry was posted on Monday, March 5th, 2007 at 8:19 pm	and is filed under BASKETBALL, March Madness Preview, RotoRob. You can follow any responses to this entry through the RSS 2.0 feed. You can leave a response, or trackback from your own site.